You might think that a cynic like me hates Valentine's Day, but I actually don't. It's a celebration of romance, candy, and restaurant food. Guys, those things are the best! What is there to hate? Gee whiz, I guess if there was a holiday centered around hot showers, Beethoven's symphonies, and finding $20 in your pocket that you forgot about, people would probably hate that too. Annie D. and I are going to have a platonic Valentine's Day date as an excuse to dress up and eat Italian food. Why didn't I think of this last year? Vegan Lent evidently starts a day later than the regular kind, because today was Vegan Pączki Day. A roller derby friend of Jason's made vegan pączkis by order and they were available to be picked up today. (Vegan roller derby girl! I know, right??) Six of us went in on one dozen, and since I volunteered to pick up and distribute them, they divided up the cost in a way that let me not have to pay for mine. 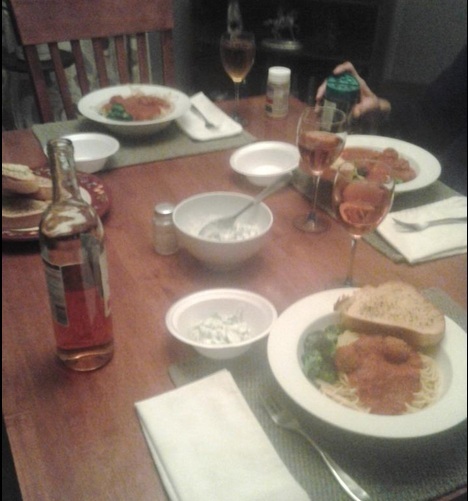 Yesterday was Joel's birthday, so Bob, my mom and I commemorated it by eating spaghetti for dinner and listening to the soundtrack to The Wizard of Oz and marching band music. I imagine that if we were royalty and this was turned into a national observance, over the centuries the origins would be lost to history, and every February twelfth families would gather and wonder why they're eating pasta and playing John Philip Sousa records. Wabash Matt texted me the other day to let me know that Mindy left a live kitten between his screen and front door. Thankfully he had the day off and was working at the house, and the kitten was healthy enough to run around in a panic when he opened his front door. Mindy has finally become an actual crazy cat lady. In other news at Wabash, Matt turned the utilities on, and discovered that the water heater that I forgot to drain when I left still works just fine.